Loaded with important details and dates, this medical complaint letter attempts to punish a rude or incompetent doctor. 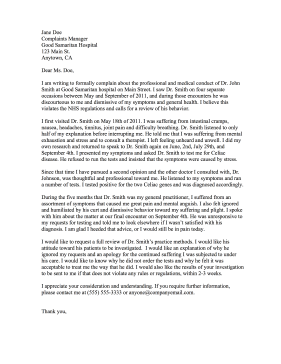 I am writing to formally complain about the professional and medical conduct of Dr. John Smith at Good Samaritan hospital on Main Street. I saw Dr. Smith on four separate occasions between May and September of 2011, and during those encounters he was discourteous to me and dismissive of my symptoms and general health. I believe this violates the NHS regulations and calls for a review of his behavior. I first visited Dr. Smith on May 18th of 2011. I was suffering from intestinal cramps, nausea, headaches, tinnitus, joint pain and difficulty breathing. Dr. Smith listened to only half of my explanation before interrupting me. He told me that I was suffering from mental exhaustion and stress and to consult a therapist. I left feeling unheard and unwell. I did my own research and returned to speak to Dr. Smith again on June, 2nd, July 29th, and September 4th. I presented my symptoms and asked Dr. Smith to test me for Celiac disease. He refused to run the tests and insisted that the symptoms were caused by stress. Since that time I have pursued a second opinion and the other doctor I consulted with, Dr. Johnson, was thoughtful and professional toward me. He listened to my symptoms and ran a number of tests. I tested positive for the two Celiac genes and was diagnosed accordingly. During the five months that Dr. Smith was my general practitioner, I suffered from an assortment of symptoms that caused me great pain and mental anguish. I also felt ignored and humiliated by his curt and dismissive behavior toward my suffering and plight. I spoke with him about the matter at our final encounter on September 4th. He was unresponsive to my requests for testing and told me to look elsewhere if I wasn't satisfied with his diagnosis. I am glad I heeded that advice, or I would still be in pain today. I would like to request a full review of Dr. Smith's practice methods. I would like his attitude toward his patients to be investigated. I would like an explanation of why he ignored my requests and an apology for the continued suffering I was subjected to under his care. I would like to know why he did not order the tests and why he felt it was acceptable to treat me the way that he did. I would also like the results of your investigation to be sent to me if that does not violate any rules or regulations, within 2-3 weeks. I appreciate your consideration and understanding. If you require further information, please contact me at (555) 555-3333 or anyone@companyemail.com.